In Goodnight From London, Ruby Sutton is an American journalist who moves to London from New York in 1940 to report on the war as a staff writer for publications in both cities. In a series of vignettes, we see Ruby through her struggles and growth in her new job as a foreigner and as a woman. Goodnight From London is a captivating story about a young woman finding her own ground in the midst of war. 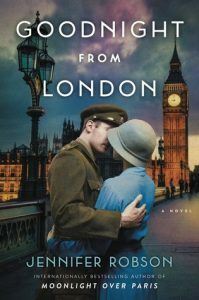 Even though the novel was told in little glimpses of her every day life, I felt like I really connected with Ruby Sutton as she navigated her way through a foreign city besieged by war, raid sirens, air strikes, destruction, rationed food, and as she found a determined, resilient hope in the people she met. For me, one of the best parts about this book is the development of her work and personal relationships. None of them felt forced, and each of them felt genuine, especially for that era. Ruby is an orphan of sorts and never really knew what it was like to have people who cared for her, and in the midst of the terror that was WWII, finding people who had been through hell but still were able to show their humor, their love, and their friendship was such an eyeopener for Ruby. We see her adjust, sometimes awkwardly, to the generosity of those around her. As a reader, I wanted to see her succeed, to see her overcome her fears and reservations, and to fall in love with that mysterious Bennett. While not as grim and heavy as some other WWII novels I have read, I enjoyed that the setting and the struggles felt realistic. 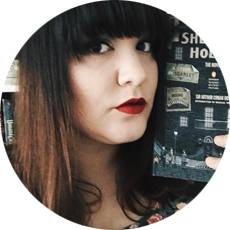 Robson’s writing style is effortless and crisp, and the writing made it clear that she has done her research. If you like historical fiction that isn’t so heavy and dark and heroines you can root for, I think you’ll enjoy reading Goodnight From London. A copy of this book was sent to me for review by Book Sparks and the publisher. All opinions are my own.